Fishing can produce some of the most exciting memories of a person's life. Whether it's reeling your first keeper, finally saving up to buy the perfect reel, or enjoying some of the beautiful scenery that defines America's outdoors, every angler has a vivid recollection of a special moment on the water. However, as memorable as any of those moments can be, they pale in comparison to the bonds that are made when you take a child out for a day of fishing. Spending some time on the lake with a child isn't a walk in the park, though, and requires patience, enthusiasm, and, depending on the age and experience level of your companion, a little different tackle than you may be used to using. Obviously, if you're fishing with an older child with some experience on the water, you won't have too much to worry about, but what about a young beginner? Well, spin-cast (push-button) reels are the easiest to use and are perfect for children or inexperienced anglers who won't be fishing that often. Furthermore, most come as premade combos with a rod and some even include beginner tackle. Several companies offer inexpensive options, ranging from small Spiderman or Barbie sets, to larger combos designed for bigger fish, all of which are easily affordable so you don't have to spend a lot of money right off the bat. As far as tackle is concerned, a fishing trip with a child will most likely be the least expensive one you've ever taken, simply because you'll only need the basics: bobbers, hooks, weights, and bait. For bobbers, most will pick up a pack of red and white plastics, but in my opinion, balsa spring floats are more durable and easier to use, especially for those just starting out. Hooks are a simple choice, as well, since you'll most likely be using bait. Small bait holder or Aberdeen hooks are ideal, and many companies make snelled versions, which have a length of pre-tied line, so you won't have to worry about fashioning knots to the hooks themselves if you're not comfortable with it. For weights, I recommend a small assorted pack of split shots. Clamping a few of these to your line with a pair of pliers will keep your bait in the strike zone, and will also add distance when casting. Choosing bait presents a few more options to go with, all of which will undoubtedly help bring fish into the boat. Live bait is a more traditional route and there are several selections to choose from. Most will opt for worms, and with good reason, due to their effectiveness. However, wax worms and crickets work exceptionally well, also, and can be purchased at any bait shop, as well as pet stores, which a lot people forget about. Preserved live bait has been a popular choice for many and can be found at most fishing tackle retailers. A popular option here is the Fisher's Choice, made by Timbuktu, which is a line of canned, preserved baits. They offer crickets, night crawlers, wax worms, and meal worms, which come 80-100 per can, have a shelf life of two years before use, and last two weeks after they've been opened. For the scent and appearance of live bait, without the hassle of wrangling crickets, the convenience of preserved baits is hard to beat. Soft plastics can play a vital role in catching fish, as well, even when bobber fishing and companies such as Berkley make several types of small plastic baits to get the job done. Available in small, plastic jars and immersed in Berkley's signature Gulp Alive scent, you can find one-inch leeches, minnows, and grubs, wax worms, red worms, and even minnow heads. Each type comes in several colors, so choosing the right color and bait for your trip will be an adventure in itself. Now that you've got all the necessary tackle for a leisurely trip to the lake, don't forget to grab a few more items to help ensure you'll be comfortable and enjoy yourself once you're there. A small cooler with drinks and snacks is a must, especially with a child. I suggest preparing the food together the night before your trip, to help build the experience before you're even out on the water. Even little things like making sandwiches go a long way to creating memories if done together as a team. You'll also want to pack sunscreen and some basic first aid supplies, just in case. Also, don't forget to bring the camera to preserve all the memorable moments, so you can enjoy them for the rest of your lives. One last thing to bring with you is, in my opinion, the most important: patience. 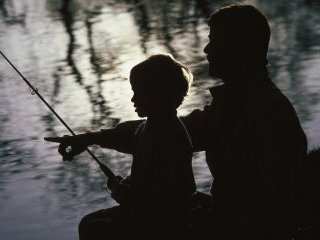 First and foremost, when fishing with a child, especially a beginner, you'll have to understand that you won't be fishing very much. More often than not, you'll spend the majority of the trip tying knots, baiting hooks, freeing line snags, and, hopefully, taking fish off the hook. Keep in mind that you're fishing with a child and a beginner, so accidents and mistakes will happen. Just be patient and remember that you're there to get out of the house and spend some time together. Take the time to teach and guide, then sit back and embrace the pride you'll feel when that first fish is caught and you see the pure excitement on your child's face! Remember to be patient, be prepared, and most importantly, remember to have fun. Fishing is about being outdoors and enjoying the challenge and rewards of catching fish. If you instill that attitude within a child and the two of you can connect and build a bond while doing what you love, the memories you'll create and share will be some of the most cherished you'll ever have, I promise. For any fishermen looking to do their part and spread their knowledge and experiences to new anglers, feel free to visit TakeMeFishing.org and check out their Angler's Legacy page. There you'll find the opportunity to sign up for free and become a member, which recognizes you as an ambassador. Take the pledge to take someone fishing and join the growing community of ambassadors throughout the country.